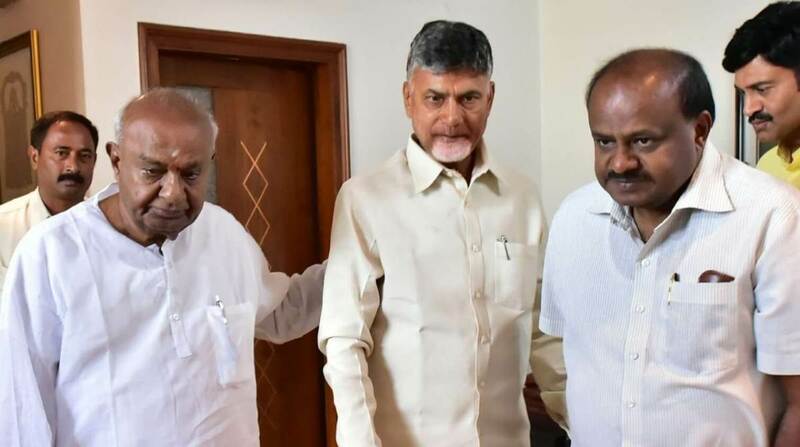 Andhra Pradesh Chief Minister N Chandrababu Naidu met Karnataka Chief Minister HD Kumaraswamy and former Prime Minister HD Deve Gowda in Bengaluru on Thursday in an attempt to stitch an anti-BJP alliance ahead of the 2019 Lok Sabha elections. Naidu was seen giving flower bouquets to the two leaders. He also specially honoured the 85-year-old Gowda by draping a shawl over his shoulders before holding a meeting with the senior JD(S) leader and his son. 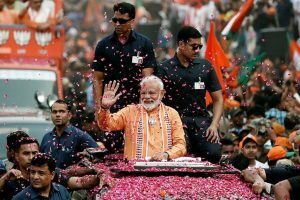 “The NDA rule under PM Modi has created many problems including destabilising constitutionally created institutes. Now, it is the responsibility of all secular parties including Congress to come together to replace NDA government,” said Deve Gowda following the meeting. “AP CM N Chandrababu Naidu has taken the lead and met several leaders to consolidate all secular parties to remove NDA government in 2019. He met me and HD Kumaraswamy today to work out further strategy,” the JD(S) supremo said. “This is an initial exercise. After that, we will work together,” the Andhra CM said while adding that other leaders such as West Bengal Chief Minister Mamata Banerjee are also organising rallies to bring together “secular” forces. Interestingly, Naidu was the Convenor of the United Front which brought HD Deve Gowda to power at the Centre in 1996. Ever since parting ways with the National Democratic Alliance (NDA), Naidu has been trying to build a grand alliance of all anti-BJP parties. Naidu’s visit comes immediately after a thumping victory of the JD(S)-Congress alliance in the Karnataka assembly elections only two days ago in which the BJP lost its bastion Bellary to the Congress after 14 years. The Congress-JD(S) coalition in Karnataka won two of the three Lok Sabha seats and both assembly constituencies in the fiercely fought bypolls, giving a shot in the arm to the ruling combine that faces frequent questions about its longevity. BJP only managed to hold on to the Shimoga Lok Sabha seat. Naidu had congratulated Kumaraswamy on Tuesday over phone on the “spectacular victory” in the bypolls. The Andhra CM had recently met NCP chief Sharad Pawar and National Conference president Farooq Abdullah, among others. The TDP supremo left the NDA alliance protesting poor funding from the Centre for his newly-formed state.